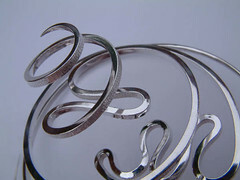 This silver brooch just slides through the cloth to give a stunning show piece. Beautifully designed and a gorgeous matching range. Square rings and bangles, especially for that special occasion! I used the element of water as the design inspiration for these pieces, which are from of an early body of work. I wanted to capture and mirror the movement and fluidity of water in a solid material. Currently I am working creating a new collection as well as some new designs for a few ‘One off’ pieces. Some of which still incorporate the same visual theme and inspiration.